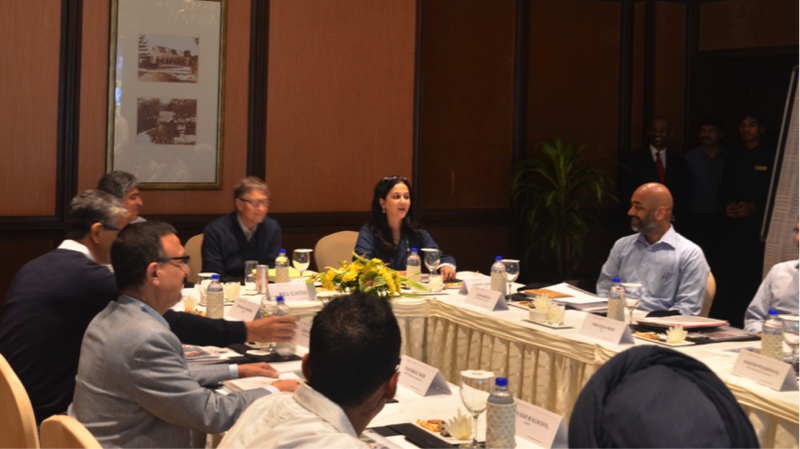 Bill Gates met with members of iSPIRT in Bangalore in December to learn about the organization and its volunteers’ efforts to solve India’s hardest problems through the use of technology. Nandan Nilekani played host to the event and also present in the room were Sharad Sharma (iSPIRT co-founder), Nachiket More (former Board member of RBI, now senior advisor to the Bill & Melinda Gates Foundation (BMGF)), and various senior members of BMGF. There were three broad themes that were covered — finance, healthcare and education — each of which forms an important part of the Gates Foundation’s work in philanthropy. Product demos included the IndiaStack, a suite of technology services currently being developed around identity, payments and personal data management for all Indian citizens; three of the leading startups in the healthcare space — Practo, Logistimo, and Swasthya Slate; and EkStep, an education-focused nonprofit that focuses on facilitated learning. Bill Gates observed that India is producing cutting-edge work and there are few countries which can boast of a digital infrastructure as sophisticated as we are producing here. With such positive encouragement from one of the most accomplished individuals in the world, the vision of transforming India at large through application of technology has received a new impetus. India is the third largest smartphone and mobile internet user market in the world with over 200 million internet users in 2013. The figures are expected to touch a staggering 500 million users by 2017, including 314 million mobile internet users according to a report by IAMAI and KPMG. Clearly, mobile phones are the ‘computing device of choice’ for the country. To keep up the momentum, the Government of India is keen on developing the digital infrastructure of the country under the Digital India program. Digital India is a revolutionary program that will empower the masses and leapfrog India into the next generation of government services. Fortunately, the lower level of investment in earlier generation technology means India has skipped the legacy era and waited for the right technology to arrive at its doorstep. To kick-start and empower the Digital India program in a very democratized form and involve the great innovation talent of the nation, the Government of India has launched an open API policy. An open API, often referred to as a public API, is a publicly available Application Programming Interface (API) that provides programmers with programmatic access to a propriety software application. This set of open API is known as the India Stack and these would enable the ease in integration of mobile applications with the data securely stored and provided by the government to authenticated Apps. India Stack is a complete set of API for developers and includes the Aadhaar for Authentication (Aadhaar already covers over 940 million people and will quickly cover the population of the entire nation), e-KYC documents (safe deposit locker for issue, storage and use of documents), e-Sign (digital signature acceptable under the laws), unified payment interface (for financial transactions) and privacy-protected data sharing within the stack of API. Together, the India Stack enables Apps that could open up many opportunities in financial services, healthcare and education sectors of the Indian economy. What this essentially means is that developers and tech startups can now build software and create businesses around the readily available infrastructure offered through India Stack, thus opening a huge potential to tap into the booming smartphone market in the country. Since the consumer market in India is very large, such startups could also hope for institutional funding and gain from the early mover advantage. Through the digitized elements like e-KYC, e-Sign, digitized Aadhaar information and digital locker, the entire ecosystem has now become a presence less, paperless and cashless based system. A Digital Locker enables users to have all their legal documents in a digitized format that is stored online and can be accessed from any part of the country. The e-Sign makes it simple for people to sign deals, contracts and legal documents through their phones and the Unified Payment Interface lets people make payments with ease through their smartphones from anywhere. India Stack makes a user base of over a billion people readily available through its API. This means that startups and tech companies can build over this to be able to integrate various functions for their businesses or for larger enterprises. Every bank or telecom operator scans through tons of paperwork every day to be able to verify customers and generate KYC documents. Now imagine the impact if this entire process could be digitized by building an application which would integrate India Stack and the user base of over a billion Indians! With the technology, documentation and sample code available, entrepreneurs and startups can get started with innovating, prototyping as well as building India Stack enabled applications. The commercial applications are endless with multiple opportunities, as the large user base opened up by India Stack is nascent, solution-hungry and largely untouched by technology. Now even a local vegetable trader can take an intra-day loan almost instantly through his mobile phone and pay it back the very same or next day without even physically visiting the bank or wasting any time (time is money when earnings are proportional to time spent)! With their e-KYC documents and digital signatures, a loan can be processed almost instantly and the money transferred through the Unified Payment Interface. Long queues at banks, telecom offices and all other government and non-governmental processes should be the thing of the past, through proper integration of India Stack. The nation is looking for “a transition from technology-poor to innovation-rich society” and entrepreneurs have a good role to play. The problems (read opportunities) in financial services, healthcare and education are all so large that only the right technology can cost-effectively solve them. Solving these scale problems would mean great business sense too. iSPIRT, the non-profit software product industry think tank powered by industry veterans, has been actively involved in the development of India Stack and is helping entrepreneurs make the best use of business opportunities provided by India Stack, while building their startups. iSPIRT believes that India Stack creates a whole new generation of business opportunities around the mobile phone and early movers would have tremendous market advantages. On a recent visit to India, Bill Gates commented on India Stack saying, “India is on the cusp of leapfrogging!” And it truly is; considering it is the only country in the world offering such an open and secure API, India is certainly looking at taking the Digital India campaign to a whole new level. The future is here and now is the time to act. 6 Steps to prevent your Product from becoming multiple Applications! All in Cartoons! Somewhere along my long software engineering career, I sat one more time rolling my eyes and clucking mentally that one more product is about to become a series of applications! We are about to create multiple code line monsters that will be demanding and expensive to maintain! Yet, this is what happens in reality in most “Product Companies” that start out with the greatest of intentions but devolve quickly into a morass of effort and expense! Do not mistake me! This is a great problem to have and solve! If you have that many clients wanting your product you are in terrific shape to begin with! You just need to manage it carefully. How do you prevent this from happening? Here are six steps to make sure that this does not happen! All in cartoons! After all, a picture is worth a 1000 words! All features needed for a client need to go through Product Management. Engineering should not be setting the priorities! Product management can always balance Sales’ priorities with Engineering capacity. Not impossible! Somewhere in the past we have used the rule “If one client requests it, it goes into the Wish List. If two clients request it, it goes into the next release. If three clients request it, it goes into the next build”. But nothing is worse than promises like these. And a proper product management function, run well, can prevent it. This is the challenge for Product Management. They should always be on the lookout for generalizing client consulting requirements and make them new but customizable features. Consulting requirements that work for client A hardly work for client B. However with some thought and ingenuity, you can generalize the requirements so that it is not only useful for A and B but also other future clients. It will be more code than you usually write as an application, but once done properly, can be reused for many, many clients in the future! Over a period of time, one of the worthwhile goals a software product company should have is to minimize custom code and maximize product features! No one really knows the exact requirements for a product unless you roll it out to at least 3 or 4 clients. You realize that you don’t need 50% of the features you thought were hot and you don’t have 50% of the features that clients truly need. This is the process of finding those out! Nothing wrong, but it is just part of the process! However, you need to formalize that process and work that in to your product release schedule. If you think this is crucial for On-premise software, you should try Software as a Service (SaaS) offerings! Even more of a challenge to get features generalized into a bunch of admin settings for a SaaS offering! One more reason to minimize custom code and maximize product features! Like here. Writing custom code for clients 1 through 5 may be fine but you need to get out of the custom code business. For startup companies it is always tempting to take on as much consulting revenues as possible, especially when it helps greatly with cash flow. It will smother and kill you, as I have seen it in too many companies myself! It’s a honey trap! Find and groom consulting partners that will do the custom code development as early as possible and get out from the applications business. Requires diligent testing, documentation and training. The sooner you do this, you will come up for air and get on with your future major version releases of your product. Also, from a fund raising perspective, if you look more and more like a consulting company, you have less of a story with investors, especially VCs. Consulting companies do not fit their investment profile too much! 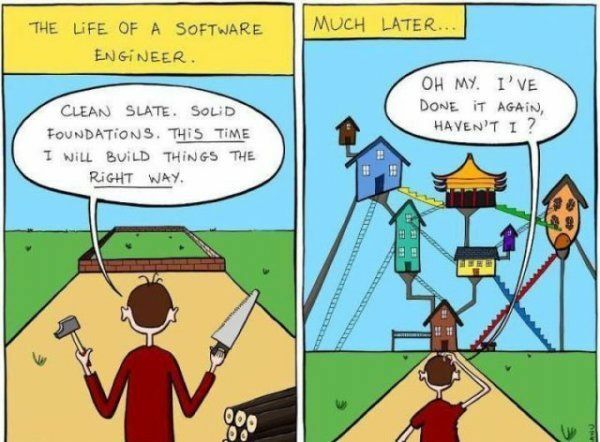 Software products become like the cartoon in point #2 above. It is inevitable! You have a preliminary architecture, you keep adding features, pretty much with duct tape and baling wire. It is then and only then you realize how you should have designed the architecture in the first place. Plus, every five years or so, you have a whole new set of advances in software engineering methodologies, languages and tools. It pays to completely re-architect your product from the ground up! It also goes with the observation that your product has a whole lot of features you need additionally and a whole lot of features that go unused by your clients, anyway. Step #5 buys you this breathing time to go off, have a few off-site meetings and re-think how your product is structured. Plus never forget that you need to migrate all your old clients to this new one, too! Crucial! Successful products evolve! But not without a lot of thought into the process of getting there! Without careful, considered forethought and planning, they can come back as a whole set of applications that can smother and choke a product company! Anup Tapadia, CEO, TouchMagix, has revolutionized interactive systems with his innovation. Driven by an aspiration to innovate and deliver great experiences in gesture based interactive display systems, his products have reached numerous brands and consumers since the company’s inception a few years back. His work has earned him recognition from the likes of Bill Gates, Dr. Abdul Kalam, Dr. Raghunath Mashelkar, R. Balki and Azim Premji who have acknowledged his sheer intelligence and tech driven entrepreneurial spirit. The British Government awarded him the “Global Young Creative Entrepreneur” honor in 2010. In an interview with ProductNation, Tapadia talks about his aspirations in making India an innovation hub and to develop world-class products. You offer a variety of interactive display solutions. What is the market potential for these products? At TouchMagix, we are focused on creating next generation interactivity and engagement technology and have created products that use motion, gesture and touch for various applications. We manufacture and supply both technology and equipment that have been creating global standards for giving audiences a lasting impact and brand impressions. TouchMagix has a variety of interactive display products like Interactive Floor, Interactive Wall, Multi-Touch MagixKiosk & Table, MagixFone and rich capabilities to build customized solutions and content. 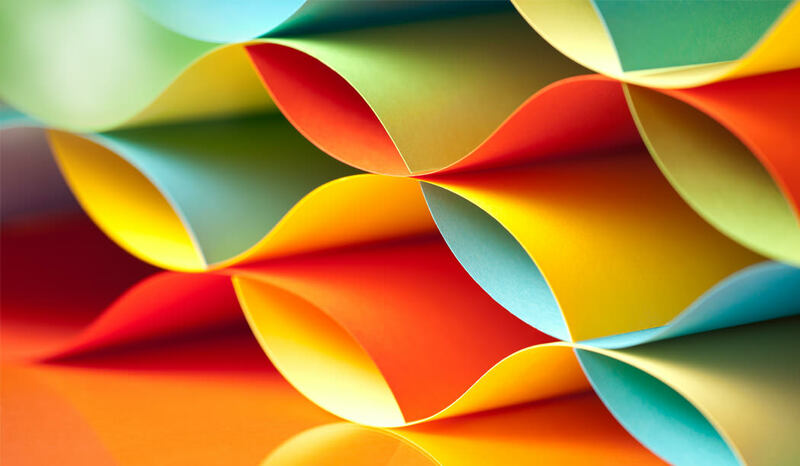 Customization of content is an aspect which increases the market potential of these products manifold. These applications range from creating engagement and experiences for brands, creating an interactive ambience in hotels and lounges, to marketing initiatives at on-ground activities. This technology is also being used for children entertainment, education and health. Being unique in nature, it enables brands to create conversations with their consumers, thus enabling them to become one with the brand. Over the years, we have penetrated globally across a variety of sectors including real estate, banking and financial sector, education, information technology, pharmaceuticals, healthcare, and hospitality sectors. Is the market willing to bet on new products? Today, Indian and global brands are looking at innovative avenues and channels to communicate with their target audience be it customers or internal audience. With brand fatigue becoming a cause of concern for brand managers, interactive products like TouchMagix is an ideal solution. The real USP of our product is in the usability, open SDK interfaces and core tracking technology IP which allows us to track gesture/touch at a higher accuracy level and speed. How soon was /will be your company feasible in terms of generating revenue? What are your sales projections? We have been profitable since the first year we started business. More than a million people have engaged/experienced TouchMagix products world wide and the number is growing continually. Indian IT industry has largely been IT services focused. What has been your experience in building products? What were the challenges faced? We firmly believe that India has the potential to create great product companies. Our experience in building products based out of India has been quite interesting. Building electronic products is not an easy task in India as it is capital intensive and expensive. A major challenge was to find the right people and retain them for R&D based jobs. The ecosystem is evolving and we are glad to be part of it. Do you feel the Indian ecosystem is software-product friendly? What is needed to create world-class products? The eco-system is still evolving and education needs to promote research driven product innovations. Most of us prefer the safer route and hence many end up in starting service based companies. For a young 24-year old guy to have been honored with the ‘International Young Interactive Entrepreneur Award 2010’ by British Council, and ‘Best Young Entrepreneur Award’ by a business magazine, says a lot about your achievements. I was drawn to computers when I was just seven. In the subsequent five years I mastered over 15 different computer programming languages. Art and Technology have always intrigued me. When I saw Tom Cruise playing around with large displays in Minority Report, it triggered a series of thoughts in my mind on the possibilities of this kind of technology if brought to reality. This led to launching of TechnoKarma Labs. At TechnoKarma, we undertook many projects in the IT networking space such as creating low-cost firewalls and a low cost wireless mesh router, which enabled Wi-Fi connectivity in IIT Pune’s campus. One of the projects from TechnoKarma Labs was later spun off as TouchMagix. My passion and perseverance to create a truly Indian product for global markets was the reason for my success. You have also received appreciation from the likes of Dr. APJ Kalam, Bill Gates, Azim Premji and others. How does it feel to be acknowledged by these eminent people? It is overwhelming when stalwarts from the industry appreciate your efforts. These endearing comments reinforced my confidence and also encouraged me to keep moving on the path of innovation. What is the road ahead like for TouchMagix? Where do you see the company going? While multi-touch technology revolutionized the way we currently perceive and engage with technology, gestures and motion will make user-interface even more immersive and instinctive. The potential of this technology is great today, and we are seeing that with the response for our products globally. From keyboard and mouse to touch and gesture, the human interaction with devices have evolved in a big way to help people interact in a manner that is appropriate for their lives. In future, we aim to create products and content that would make human interaction with devices more intuitive and enable us to create memorable experiences. What learning would you like to share with others from what you have learnt? For emerging entrepreneurs I would suggest it’s essential for one to work at one large corporation and one small start-up to experience and understand the functioning of both setups. I feel India is a land of great opportunities and there is never a better time than now to kick-start new business in a growing economy. MotionMagix™) converts any floor/wall into an interactive space for educating and engaging users with fun, action and excitement. MagixTable™ is world’s thinnest 40 point multi-touch plug-n-play surface computer table loaded with rich application suite and easy customization for corporate and entertainment application. MagixKiosk™ 32″ 1080p HD can be used in 4 different form factors like table, tilted kiosk/workstation, high bar table, or as a standing flat display. MagixFone™ is Any Display Any Phone interactive technology which gives your audience the ability to control the screen for playing games, answering quizzes, sending social messages and much more using their mobile phone. MagixFone™ hardware picks-up the call or interprets an SMS which allows the user to use his/her mobiles keypad or voice to interact with the display.